Tsarskoe Selo, in the town called Pushkin near St. Petersburg, is one of the area's most impressive sights. The palace complex of Tsarskoe Selo (which means “Tsars' Village” in Russian) includes attractions that are popular draws on their own: the Catherine Palace and parks, the Alexander Palace and parks, and associated outbuildings that have been restored or renovated into exhibition spaces. The entire complex is a part of the UNESCO-protected Russian World Heritage site and will dazzle you with its beauty so completely, you'll be seeing tsars! When you visit Tsar's Village for the first time, you'll want to be aware of four broad-category sights. On a second visit to the royal complex, consider taking in some of the secondary attractions or temporary exhibitions on the grounds, most of which have separate entry fees and require time dedication. 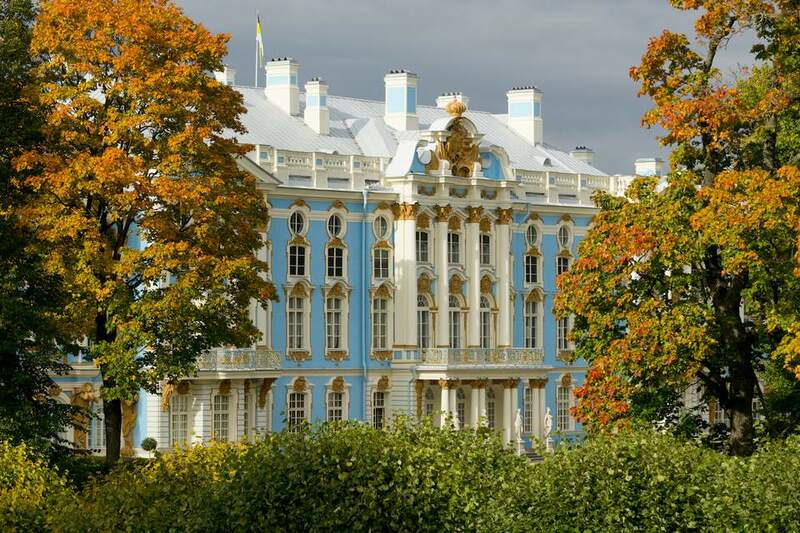 Catherine Palace: The Catherine Palace is one of two grand palaces at Tsarskoe Selo. Though it was built by Empress Elizabeth and named for her mother, Catherine, it was the better-known Catherine the Great who made the palace her place of summer residence, employing the work of architects and craftsmen to customize the palace to her particular tastes and requirements. Visitors to the Catherine Palace will feel Catherine the Great's presence and her love of luxury within its sumptuous rooms. The Catherine Palace wasn't used by any Russian tsar as regularly as Catherine the Great, so her influence in the palace's appearance remains. The Catherine Palace is also where visitors can see the recreated Amber Room, which glows with the careful placement of tons of many-hued Baltic Sea amber. Catherine Park: Visitors have plenty to feast their eyes on here; the Catherine park is much more than the name implies. The grounds include the gardens and outbuildings associated with the Catherine Palace, many of which have been renovated and can also be viewed from the inside. Take a ferry around the Great Pond or explore the park on foot while you envision Catherine the Great out on a stroll with her beloved dogs, who are buried in a special cemetery designated specifically for them. Alexander Palace: The Alexander Palace was most famously used by Nicholas II and his family. Due to the chronological proximity of the age of the last tsar—who was dethroned less than 100 years ago—to our own time, the ghosts of Nicholas and Alexandra seem to haunt this palace and the legends that surround their life imbue the space with special meaning. Where the Catherine Palace focuses visitors' attention on royal opulence, the Alexander Palace provides a touching portrait of the Romanov family. Alexander Park: The Alexander Park is less groomed than the Catherine Park, but given its closeness to the Alexander Palace, it isn't difficult to imagine Nicholas II's children playing here. The infamous mystic, Rasputin, was also buried in the area directly after his death, but so reviled was he that the body was disposed of after the Revolution. Seeing Tsarskoe Selo in its entirety will take a whole day or more, so plan to arrive early and leave late, especially during the summer months when tourist numbers swell. Most guided tours are in Russian. English-language tours are subject to guide availability, and Tsarskoe Selo doesn't accept advance booking for individual visitors to the museum. Almost every section of Tsarskoe Selo requires its own entry fee, so if you're on a budget, you'll want to have an idea of ticket prices and the complete cost of admission to all of the sights you want to see. Catherine Park and Catherine Palace tickets must be purchased together. You can buy tickets to the Alexander Palace once you're there, but the Alexander Park requires no entry fee. Prepare to overpay for refreshments and snacks at the palace complex. Look for vendors selling popular Russian street food, such as blini, to dine on the run and save both time and money. Cafes within the palace complex give you the opportunity to rest your feet while you refuel. To learn more about ticket prices, hours of operation, and both temporary and permanent exhibitions, visit the Tsarskoe Selo website, which can be accessed in both English and Russian languages. When you're trying to get to Tsarskoe Selo, it helps to be able to recognize the Russian language words for pertinent places because signs may only appear in a Cyrillic text. Tsarskoe Selo [Царское Село] is located about 25 kilometers from St. Petersburg [Санкт-Петербург], and minibusses run from the Vitebsky rail terminal after a stop at Detskoye Selo [Детское Село] (train station in Pushkin [Пушкин]). You can also reach Tsarskoe Selo from the Moskovskaya [Московская], Kupchino [Купчино], and Zvezdnaya [Звездная] metro stations. Most minibus routes require you to change in Pushkin.